I really enjoyed Edge of Tomorrow (an 8 on my movie list), but one plot detail really bugged me. If you haven’t seen it yet, I’m not going to spoil anything directly. It’s part of a larger category that happens in most action movies actually. This particular example doesn’t happen in Edge of Tomorrow: every time there is a countdown timer where something really, really bad will happen (typically an explosion), the protagonist will save the day with one second left til destruction, whether the timer was originally set to five minutes or five hours. In every action movie there are several of these “just in time” moments. And yes, I understand, this is what makes the movies suspenseful. Did the aliens annoy me? Nope. Time travel loops? Nope. But impeccable luck and timing? Yes. Is there any deeper meaning behind this? People have said that I over-criticize movie meanings, but I think this does have some harmful effects. The “protagonist always gets the girl” cliché is the worst in terms of social damage for obvious reasons, but “one second left” has its own issues. It distorts our views of luck and chance, thereby affecting our risk judgment, and it turns the extremely improbable into the probable. Of course, I still enjoy action movies and TV that use “one second left.” But it just gets difficult to keep up suspension of disbelief when the most absurd chance events happen over and over again. With three recent deadly shootings (one in Isla Vista and the second in Seattle; a third in Las Vegas as I was writing this post), I’ve once again heard many ignorant statements thrown around regarding video games and violence. Much of the ignorance comes from making blanket statements completely lacking in nuance, from both sides. 1. The anti-video game side ignores the actual crime statistics. Whether you look at the past decade or past two decades (when video games arose and flourished), you see that general crime, violent crime, and juvenile crime are all down significantly. The point is that even if a study comes out demonstrating a link between video games and aggression, it is another step to go from aggression to actual violent crime, which is hard to measure because we can’t just run experiments on violent crime. To show that video games have a strengthening effect on the crime rate, you must show that in the absence of video games, the crime rate would be decreasing faster than it already is (or something equivalent to that). 2. Both sides have a wrong assumption about overall crime. Because our media gives plentiful attention to violent crimes—the more deaths, the better—we get a sense that the nation is becoming more violent, and we desperately look for any changes that could have caused this increase in violence. Despite a sharp decline in the United States’ violent crime rate since the mid-1990s, the majority of Americans continue to believe the nation’s crime problem is getting worse, as they have for most of the past decade. Currently, 68% say there is more crime in the U.S. than there was a year ago, 17% say less, and 8% volunteer that crime is unchanged. When I surveyed perceptions of violence in an Internet questionnaire, people guessed that 20th-century England was about 14 percent more violent than 14th-century England. In fact it was 95 percent less violent. 3. The pro-video game side ignores the link between video games and aggression. Just like ignoring crime statistics, one can also ignore psychological effects of violent video games. In a meta-analysis of the psychological literature, Craig A. Anderson and Brad J. Bushman, violent video games were generally found to be associated with aggression . One concern of violent video games is that violence is often rewarded. A study [6,7] shows a difference in player aggression between a game where violence is rewarded and one where violence is punished. It would be nice if psychological results were not ignored by the pro-video game side. On the other hand, psychological results are often tenuous and likely to be wrong. So it would also be nice if the anti-video game side took these results with a bit more caution. After all, some studies are skeptical of the video game-aggression link [8,9]. Finally, even if we assume that violent video games definitely lead to increased aggression, this is one step removed from deducing that video games actually lead to violent crimes such as shootings. 4. Mechanisms are argued instead of statistics. I wrote about this topic before in my blog post “Mechanisms vs Statistics,” which incidentally used video games and violence as the example. Even with statistics, we have to make sure to interpret the data carefully. Being relaxed with statistics will lead us to believe the wrong things. While it may seem comical at best, it is the only time I have seen such a sustained visual depiction of confirmation bias, satirical or not. The popularity of the article demonstrates that everyone can and does understand what confirmation bias is. Unfortunately, people tend to think they are less biased than everyone else (which is itself a bias), so that they simultaneously enjoy this Buzzfeed article and make fun of conspiracy theorists and superstitious worshipers, yet often believe in equally ridiculous things. Namely, if you change the title to “28 Shocking Pictures That Prove That God Does Good Things All Around Us,” I have a feeling it would be much less satirical, and if it was, people would call to burn the writer at the stake. Of course, the punchline of the Illuminati images is that the criterion for being the Illuminati, i.e., being a triangle, is so vague that it can literally appear anywhere. Sound familiar? I’ve always wondered whether the rigorous application of statistics is underutilized in the social sciences. This is less so a problem in economics, where the subject is, by nature, highly quantitative. But in fields like psychology, sociology, and political science, where a background in mathematics is not common (unlike for biology, chemistry, and physics), researchers can intentionally or, very often, unintentionally (this is a really good Economist article) produce wrong results by abuse or misunderstanding of statistical inference. As an onlooker whose training is in mathematics, I cannot help but to feel frustrated by the lack of numeracy in our “scientists.” The Economist article does a good job at showing how failure to understand statistical concepts leads to false results being published, even past peer review. What triggered me to write this post was an assigned reading for a comparative politics class. In it, Adam Przeworski discusses the inherent selection bias in matching countries for experimentation. Noting that democracies have higher economic growth rates than authoritarian regimes, Przeworksi brings in the relevant data that democracies have a significant chance to die off when faced with economic failure whereas authoritarian regimes are not as affected. Hence, observing that democracies have higher growth rates does not signify that democracy leads to economic growth, but rather that economically failing democracies are not observed because they tend to disappear. In context of a comparative politics theory symposium, this makes a lot of sense to state. But the phrasing is really interesting to a math person: selection bias is a given, and is one of the tools we use to analyze anything. My instinctual reaction to the reading was “Duh, obviously there is selection bias.” While I am sure the field of comparative politics is more aware of selection bias than Przeworski makes it appear to be, the fact that Przeworski framed it as such (“what the statistical literature calls ‘selection bias'”), as if to imply that the formal tools of statistical inference are generally beyond the scope of comparative politics theory, is a bit unnerving. Przeworski, Adam in The Role of Theory in Comparative Politics: A Symposium, World Politics, Vol. 48, No. 1 (Oct., 1995), pp. 1-49. You can quickly see patterns in complex problems. You like to come up with new ideas and new projects. You have a low tolerance for busywork, tedious errands, and filling out forms. You are great at outlining what needs to be done, but filling in the details can feel exhausting. You may have been described as right-brained. When you have taken the Myers-Briggs assessment, you were an N.
You think about things in great detail and sometimes miss the big picture. While you are certainly smart, others may joke that you lack common sense. You would prefer to edit or tweak a plan than to come up with it from scratch. Highlighting study notes doesn’t work for you, because you end up highlighting everything. You may have a tendency to over-think things. You may have been described as left-brained. When you have taken the Myers-Briggs assessment, you were an S.
While this may be a good indicator of which type of thinking is more dominant, it doesn’t look at the two in combination. For me, big picture and detail thinking are very intertwined. I’ve always considered myself a big picture thinker, and I even have the N on the Myers-Briggs test. In addition, I consider some of the worst arguments to be the ones where something is taken out of context. Generally I don’t try to bog myself down with details, but often the two types of thinking aren’t mutually exclusive; sometimes the application of big picture thinking requires an enormous attention to detail. Whether a large-scale plan succeeds often depends on the tiny details. In chess, the big picture vs the details is analogous to strategy vs tactics. Strategy provides you with overall guidance: should I attack the kingside or the queenside, should I seek to trade a bishop for a knight? Tactics govern how such plans actually take place: if I attack the kingside this way, then my opponent will play this counter, then I will play this move, etc. I try to keep a balance of strategy and tactics, as having one without the other can lead to disaster. I guess an analogy would be that to get somewhere, you need a map and a car. Having a map without the transportation is useless, and having a car but no idea how to get to your destination is futile. Though if you had to pick only one, I guess having the car is a better idea. The big picture vs detail oriented thinking comes up a lot in political/economic/social debates. Often it’s the knowledge of many related facts that leads to a more accurate big picture understanding. To take a not super-controversial topic, consider the funding and effectiveness of NASA. We know that it has declined significantly since landing on the moon. And we know that landing a human on Mars should be done soon, and we could argue that if only NASA had more funding, we could be much further in space exploration. Of course, the previous is a pretty naive representation of the NASA situation. During the 1960s, we were at the height of the space race in the Cold War, and NASA was considered not only as an institution for scientific research, but also an institution for national security. Landing on the moon was inspirational not just as a feat of humanity, but also as a feat of us beating them. In addition, as many inventions come from military purpose, there are obvious military implications of having satellites in orbit around the earth, but there are much fewer in having any on Mars. And the economic investment would take much longer to return. You could keep piling on more relevant details to get a better picture. The point is, to get a good high-level understanding of something requires extensive knowledge of the details surrounding it. On the other hand, making sense of small details often relies on seeing the big picture. Every bit and fragment of the news makes more sense the more you understand current trends. Events that seem unrelated may very well be correlated, but the correlation may only be visible from bird’s eye view. For example, LGBT rights and the abortion/women’s rights may seem unrelated, but there is a common denominator: religion. Resistance against LGBT rights and abortion are both connected to religious beliefs in the same way, and even the arguments for resisting either movement come almost solely from religious arguments. This is why on this blog I discuss religion a lot but rarely LGBT rights or abortion—dealing with the root cause is more imperative than dealing with the symptoms. In all, both big picture and detail oriented thinking are important, and one needs both of them to have a deeper understanding. Without the big picture or the details, one has a limited grasp of the situation. 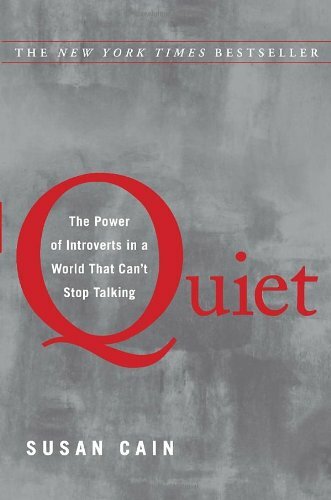 This is a review of Susan Cain’s Quiet: The Power of Introverts in a World That Can’t Stop Talking (2012). Being an introvert in almost every way, I wasn’t expecting to learn too much about my own behavior from the book. Indeed, the personality descriptions and key features of introversion are mentioned in the book. There was, however, still much to learn about introversion vs extroversion from a societal perspective. I had never thought about this before. After all, introversion is almost a societal taboo: from the first day of school to the last day of one’s job, there are boundless social encouragements to be an extrovert—or at least to pretend to be an extrovert. I’ll go through some of the book’s main results. One of the most interesting points of the book is that extroverts are overrated in teamwork skills. Cain relates a game called the Subarctic Survival Situation, given to incoming students at the Harvard Business School. Individuals within a team are supposed to rank the items in a list of tools based on which would be the most important for survival in a freezing condition. Then the team can collaborate and come up with a team ranking. If the team ranking is better than every individual’s ranking, the team is said to have synergy and be successful. Otherwise, if one person on the team had a better individual ranking than the team ranking, it means the team did not cooperate well enough. In addition, Cain cites studies which show that extroverts and introverts both make good leaders, but of different people. Extroverts were more effective when leading passive types, that is, those who did their job without exercising initiative. However, introverts were more effective when leading those who did actively try to improve work performance. This makes sense. Those who are more passive may need extra guidance, while those who take initiative don’t need to be bogged down by micromanagement. The style of “groupthink” took its own chapter: “When Collaboration Kills Creativity.” Study after study show that ideas might be better if extroverts weren’t so overvalued. Cain cites the work of Jerome Kagan, a developmental psychologist, who was able to successfully predict whether babies would turn into extroverts or introverts based on reactiveness. Counterintuitively, it was the high-reactive who became introverts. It makes sense though, as the high-reactive are more moved by external stimuli, while the low-reactive are unfazed. Hence the low-reactives are the extroverts: they handle unfamiliar social situations with calm, while the high-reactives tend to stay away from such situations. Some of the evolutionary principles behind the different behaviors are also explored. In another famous study, introverts and extroverts were asked to play a challenging word game in which they had to learn, through trial and error, the governing principle of the game. While playing, they wore headphones that emitted random bursts of noise. They were asked to adjust the volume of their headsets up or down to the level that was “just right.” On average, the extroverts chose a noise level of 72 decibels, while the introverts selected only 55 decibels. When working at the volume that they had selected—loud for the extroverts, quiet for the introverts—the two types were about equally aroused (as measured by their heart rates and other indicators). They also played equally well. How do introverts and extroverts compare on academic tasks? Introverts are not smarter than extroverts. According to IQ scores, the two types are equally intelligent. And on many kinds of tasks, particularly those performed under time or social pressure or involving multitasking, extroverts do better. Extroverts are better than introverts at handling information overload. Introverts’ reflectiveness uses up a lot of cognitive capacity, according to Joseph Newman. On any given task, he says, “if we have 100 percent cognitive capacity, an introvert may have only 75 percent on task and 25 percent off task, whereas an extrovert may have 90 percent on task.” This is because most tasks are goal-directed. Extroverts appear to allocate most of their cognitive capacity to the goal at hand, while introverts use up capacity by monitoring how the task is going. This speaks very true for me.